Almost half of the U.S. population lives in areas where air pollution levels are often dangerously high for them to breathe, according to a report released Wednesday by the American Lung Association. The group's annual "State of the Air" report finds 47 percent of Americans live in counties with frequently unhealthy levels of either ozone or particulate pollution. That's up from 42 percent in last year's report. The five communities with the worst air pollution were all in California. Los Angeles-Long Beach topped the list with the highest ozone levels, while Fresno-Madera was found to have the most particle pollution. Four cities ranked the cleanest in all three categories: Salinas, Calif., Cape Coral, Fla., Bangor, Maine and Bismarck, N.D. Although the air is much cleaner overall than it was a decade ago, the report found the nation's air quality still worsened from 2010 to 2012. China's super smog: Gov't official calls Beijing pollution "unbearable"
Looking at average levels of pollutants from 2010, 2011 and 2012, the report found that ozone levels were higher -- likely due to warmer temperatures. However, both year-round and short-term particle pollution were much lower than the numbers reported in 2013. Still, this year's finding of a "great increase in ozone pollution is of great concern," Dr. Norman Edelman, who was involved in preparing the report, told CBS News in an email. 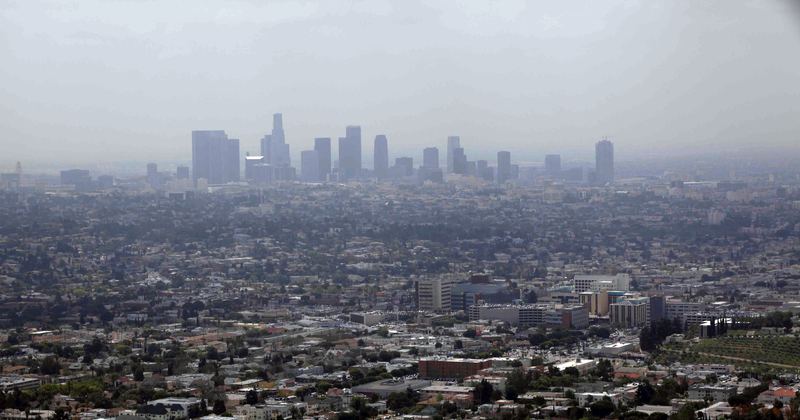 Several of the nation's biggest cities saw ozone conditions worsen. Los Angeles, New York City, Chicago, Las Vegas, and Philadelphia all reported more high ozone days. The amount of ozone is "strongly related to the amount of automobile exhaust, which is related to population density," explained Edelman, a professor of preventive and internal medicine at Stony Brook University. Climate and geography also play a role. "Some cities are in a 'bowl' which collects pollutants," he said. The report estimates that more than 140 million Americans live in areas with high levels of ozone. This puts them at risk for premature death, aggravated asthma, difficulty breathing and future cardiovascular problems, according to the report. Particulate pollution also remains a concern even though levels have declined. The number of particles in the air are related to industrial usage, such as coal-fired power plants. "Over the years, extensive epidemiologic studies have shown as much as a 20% increase in ER and hospital admissions of patients with heart and lung diseases when particulate pollution peaks," Edelman said. According to the report, out of 25 cities with the worst levels of year-round particle pollution, 18 cities showed lower levels than previous years -- including Los Angeles, Pittsburgh and Cincinnati, which improved to their lowest levels. Four cities, including New York, improved over 2013, but had reported cleaner air in the past. Five cities showed an increase in year-round particulate pollution, including San Diego, Birmingham and Phoenix. Most cities affected by the worst short-term particle pollution also showed some improvement over previous years. According to the report, not only are millions of people at risk for possible health effects of these pollutants, including those who are prone to COPD and cardiovascular disease, but millions who live in poverty are likely to live in an area where these levels of pollutants are extremely high. Since the passage of the Clean Air Act in 1970, the United States has cut down on air pollutants by more than 41 percent as of 2010, according to the Environmental Protection Agency. Environmental regulation still has its critics, but got a boost this week from the Supreme Court, which upheld the EPA's power to regulate pollution from coal-fired power plants. That decision "is an important victory for the health of the public," Edelman told CBS News.